I had an absolute blast playing Smart Kobold, Jeff's entry for 2010's challenge, so I was very much looking forward to playing Vicious Orcs. So my original plan was to save this one for last. Vicious Orcs is beautiful to look at. Like many games this year & last, it uses libtcod. But not in an overly obnoxious way. No diffused multi-colored light or particle effects. 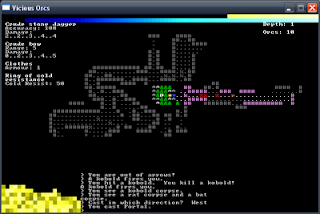 My personal preference is for roguelikes to look like well, rogue. 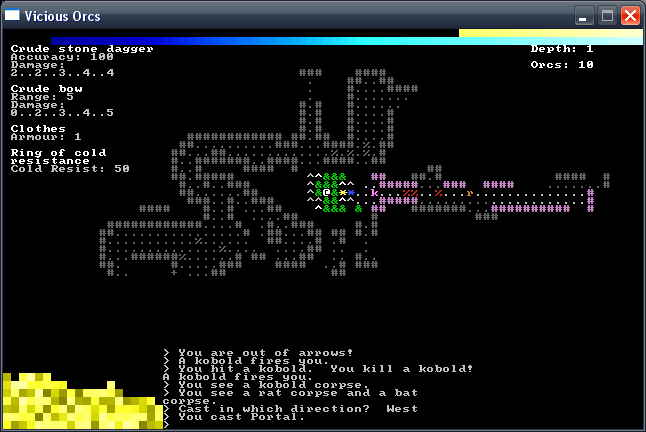 Games like Brogue are about as fancy I want my graphics to get. That being said, Vicious Orcs is also amazingly fun to play. It is simple, but in a complicated way. It has enough strategy in it to make it fun. It is rare to see a fully finished game done for a 7DRL. The combat has a good feel to it, and the town is tons of fun. The limited inventory took some getting used to, but feels necessary in a game like this. I hope the town's folk didn't mind me leaving my broken armor lying around. Speaking of broken armor, I really dug that whole mechanic. Finding a broken weapon/armor in the dungeons is awesome (OMG PLATE MAIL), then taking it to the forge to get repaired is almost inevitably more expensive than your current gold supply. So, it's off to the dungeon to get more gold. Except then you find an even BETTER weapon. Repeat. At first the non-euclidian dungeons bugged me (as they did in Smart Kobold), but once I saw what was possible with the Town Portal spell, I was a convert. 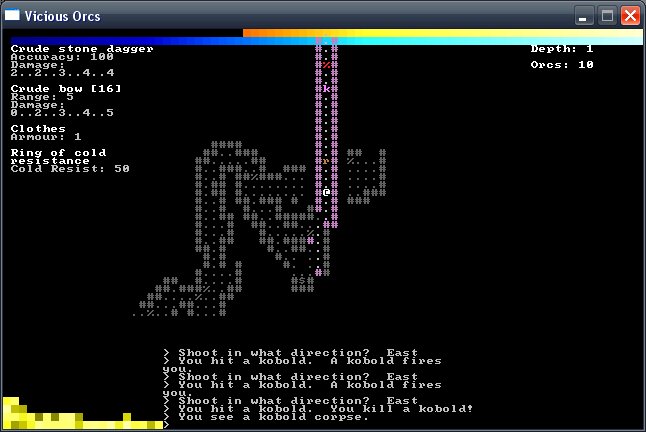 Simply amazing stuff to see in a roguelike. My favorite feature might've been the "Orcs" count in the top-right corner. Just seeing that '10' sitting there the entire game made me REALLY want to kill some orcs. A surprisingly large amount. I'm guessing that was the intent. I've likely started out with one of the best of this bunch of 7DRLs, but I'm glad I did. I'll be coming back to this one once I am done with these reviews for sure. 5 out of 5 @s.
You can find a list of all 7DR L2011 finishers on roguebasin or temple of the roguelike. 7DRL 2011 Reviews - Regicide!